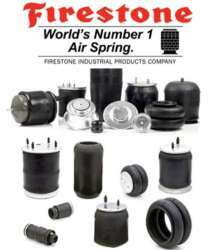 The Air Spring Supply Company is the Sole Distributor of Firestone Air Springs in Southern Africa. We cover the full range of Air Springs, from Industrial Applications to Aftermarket Replacement Air Springs for Air Suspension Trucks, Trailers, Busses and Vehicles. Please contact us for any enquiries and quotations.